Roberto Patino greets children at a children's center in the La Vega neighborhood of Caracas, Venezuela, Aug. 26, 2018. Roberto Patino, a rising star in Venezuela's unraveling opposition movement, pushes through a crowd of children clutching spoons and waiting to eat. 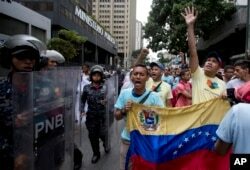 Opposition leader Leocenis Garcia, right, with members of his party, shout slogans against Venezuela's President Nicolas Maduro outside the attorney general's office, where police stand guard, in Caracas, Venezuela, July 18, 2018. Marialbert Barrios speaks to a group of women at an empowerment workshop, in the Catia neighborhood of Caracas, Venezuela, Aug. 26, 2018. 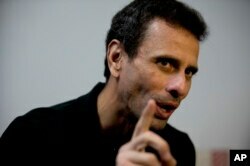 FILE - Venezuela's opposition leader Henrique Capriles speaks during an interview at his office in Caracas, Venezuela, July 30, 2018.